AMAPCEO, which on Sunday voted 94 per cent in favour of a strike for the first time its history, represents 11,500 professional and supervisory Ontario government employees working in every ministry and many agencies, boards and commissions. “Talks have not been going well,” a senior Liberal said hours after Hudak and Tory MPP Vic Fedeli (Nipissing) released the “communications rollout” of Finance Minister Charles Sousa’s May 1 spending plan. AMAPCEO president Gary Gannage said, “in this environment you’re always looking for a scapegoat. “I have no reason to think it’s AMAPCEO — AMAPCEO members are professionals. 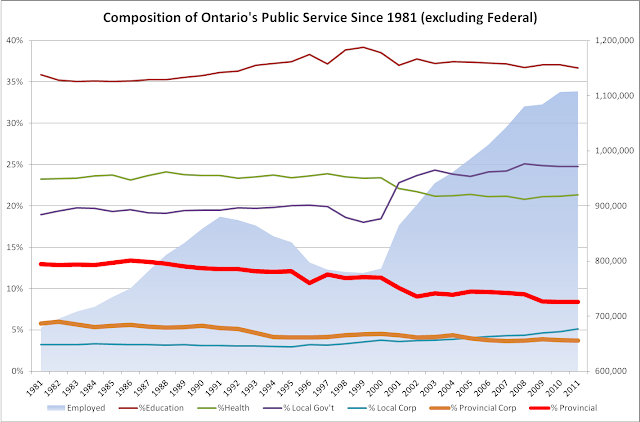 There’s a lot of disillusionment and anger in the Ontario public service right now,” said Gannage. The Ontario Power Authority (OPA), the entity legally tasked with developing Integrated Power System Plans (IPSP), has posted a "Memorandum of Understanding between the Minister of Energy and The Chair of The Ontario Power Authority." I didn't read it, but I got a chuckle out of it. The McGuinty/Wynne government essentially abandoned professional planning in 2008 with the introduction of the Green Energy Act - gave a half-hearted stab at returning to it in 2011 (burying the resulting IPSP draft), and under the current Premier and Minister of Energy have abandoned it altogether. This is problematic because the unloved minority government can't kill the OPA (legislation to do so died when McGuinty prorogued the Parliament as the unfolding gas plant scandal made it clear he was a pro rogue himself); none of the parties in government want it to exist, but none will work together on reworking the sector. So the OPA's folks, after years alternating between doing serious work only to be ignored and following idiotic Ministerial directives, have their eye on unionizing. Thus the agreement setting out some boundaries either to avoid what was cryptically referred to as "third party intervention" during my years at a big organization, or as the first outcome of its inevitability. The Globe Adam Radwanski has a column exploring feelings about selling Ontario's assets to give Toronto stuff it's not willing to think through doing intelligently it's dang self. The news inspired me to re-read my own Manning Up: A Weak Week for Ontario in the Electricity Sector, et al., from a pre-budget period 2 years ago - which I invite others to read as the latest attempt to purchase an election unfolds.